Good tip about searching for a person's birth without the first name. This worked for my grandmother. Guess I won't be going to bed on time tonight. Not only was this information very useful, Tom really inspired us to get the stories! Thank you. I didn't know about the passenger lists posted in newspapers. Thank you! 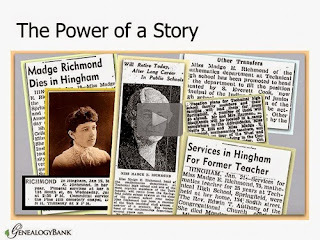 If you could not make it to the live event or just want to watch it again, the 1 hour 34 minute recording of "GenealogyBank - The Power of Finding Our Ancestor's Stories" is now available to view in our webinar library for free for a limited time. Or watch it at your convenience with an annual or monthly webinar membership. Use webinar coupon code - genbank - for 10% off anything at www.FamilyTreeWebinars.com or www.LegacyFamilyTreeStore.com, valid through Monday, May 18, 2015.